Fastcase is a comprehensive, nationwide law library, including case law, statutes, regulations, court rules, constitutions, and law review articles. It's one of the largest online law libraries in the world. Identify the most authoritative cases in results, every time. Fastcase integrates citation analysis into search results, telling you how often each case in your results list has been cited. It’s like Shepardizing or KeyCiting each case in search results, except that you can see the results automatically integrated into search results. Now you can sort the most seminal case to the top of the list, with one click. Only Fastcase offers this powerful tool. Fastcase’s powerful sorting algorithms bring the best results to the top of the list every time – making research powerful, fast and easy. Search results are listed in relevance order by default, but you can re-sort the list to fit your research, to prioritize what’s important to you in every search. Sort in date order, highest court first, alphabetical order, or most cited cases at the top of the list. 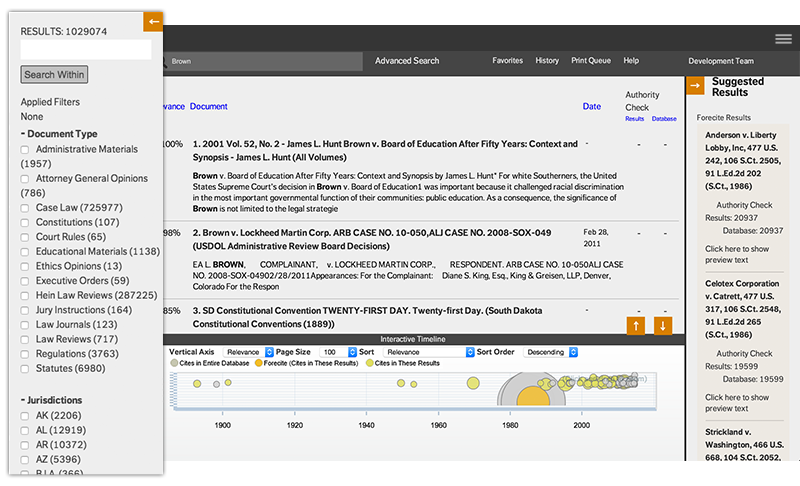 Fastcase’s powerful sorting tools make it easier and faster to find the cases you need, no matter what kind of research you’re performing. 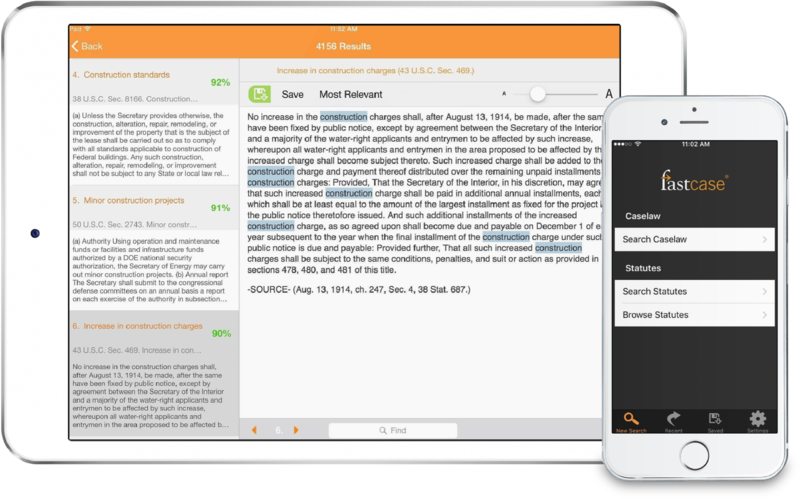 Fastcase puts the entire American law library in the palm of your hand with free mobile apps for iOS, Android, and Windows Phone. Map search results visually, so you can see at a glance which are the most important cases. 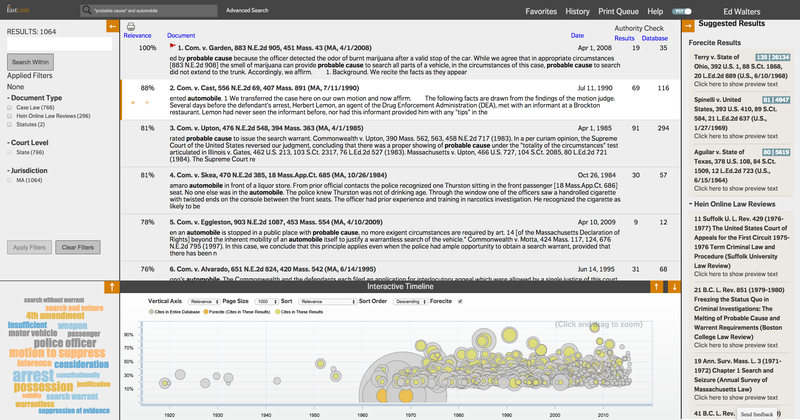 The patented Interactive Timeline view of search results plots all of the search results on a visual map, showing how results are distributed over time, how relevant each case is based on your query, how often each case has been cited generally in the database (“cited generally”), and how often each case has been cited by the super-relevant set of other search results (“cited within”). Mouse over any case on the map and get the case name, citation, most relevant paragraph, and citation analysis for that case. The patented Interactive Timeline is the most advanced legal research tool in the market – there’s nothing else like it! Unlimited printing is included in every Fastcase subscription. Print beautifully in Word or PDF, in single or dual-column format. Batch print cases with ease! looking less like its competitors in the ‘low cost’ market." 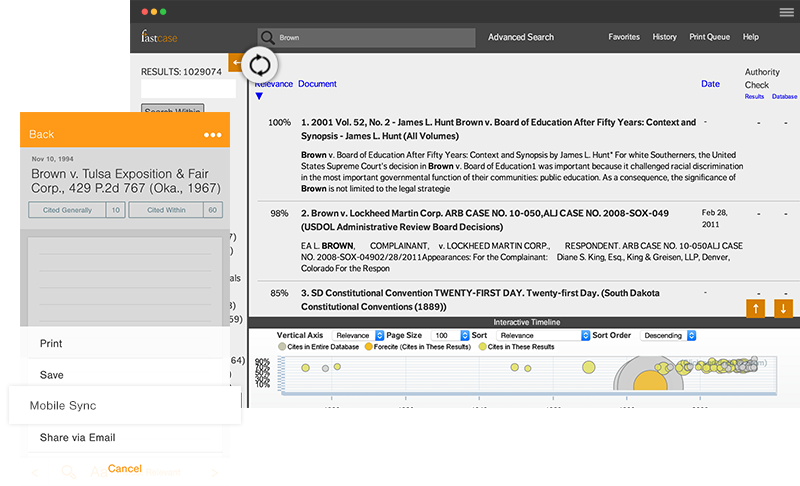 "Fastcase is one legal research app you definitely should have in your toolbox." "Like the Tesla Model S, Fastcase 7 is faster and smarter, but it’s even better than Tesla because you won’t have to search for a Supercharger to use Fastcase." "This system is designed to cater for the fact that legal research almost always involves delving into a very specific area of law rather than generically searching for cases. 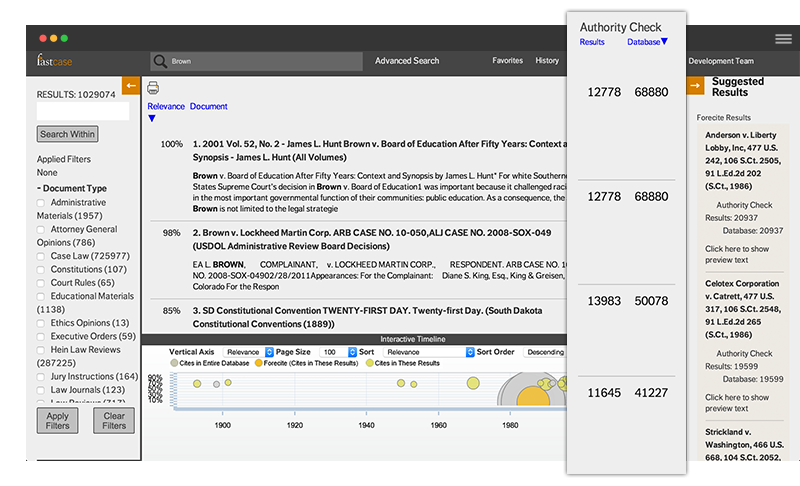 This presumption has led the Fastcase team to feature a search function which shows not only how popular a particular case citation is in terms of how many times it has been cited in other cases but also demonstrates its popularity based on how many times the term has been cited in that particular area of law, providing search results which are arguably far more relevant." "At all times, everything users need to access the cases and statutes that comprise the whole of the content, is presented cleanly and intuitively on the screen." "When a company already has a winning platform, it is a big gamble to jettison it and replace it with something that is entirely new… Current users will be glad to know that this new version does not discard any of the functionality that was already available in Fastcase. Rather, it enhances that functionality in several respects — most notably with universal search — and does it through a faster, more intuitive interface that puts all the key resources and tools right in front of you. I know that Fastcase spent a long time developing this new platform and put a lot of thought and work into it. From what I’ve seen so far... the gamble paid off." 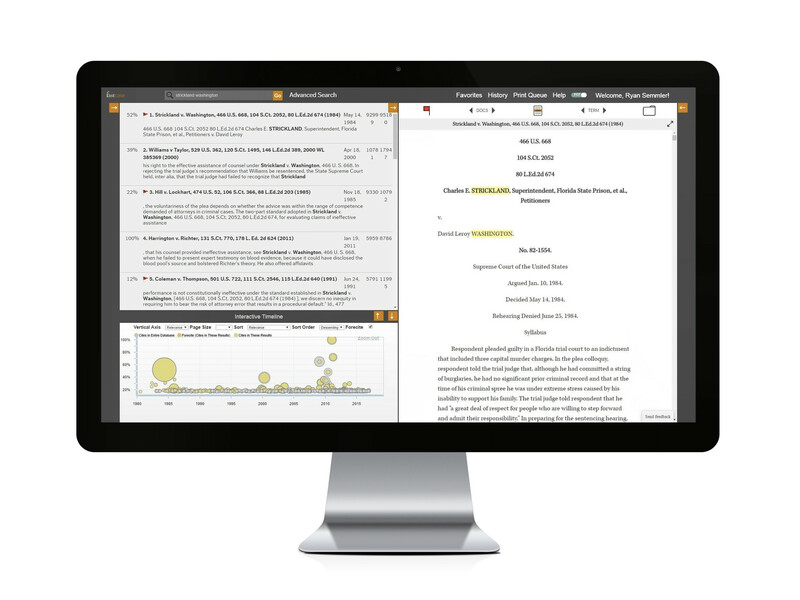 "Fastcase 7 is a platform which invites lawyers into deep interaction with the content. Each screen has an amazing variety of visually distinct displays which invite a researcher to explore their search results in different ways."